Fall is arriving in Nashville! The mornings and evenings are becoming delightfully crisp and cool, which is getting me excited for hearty cold-weather food, like stews, soups, and risottos. 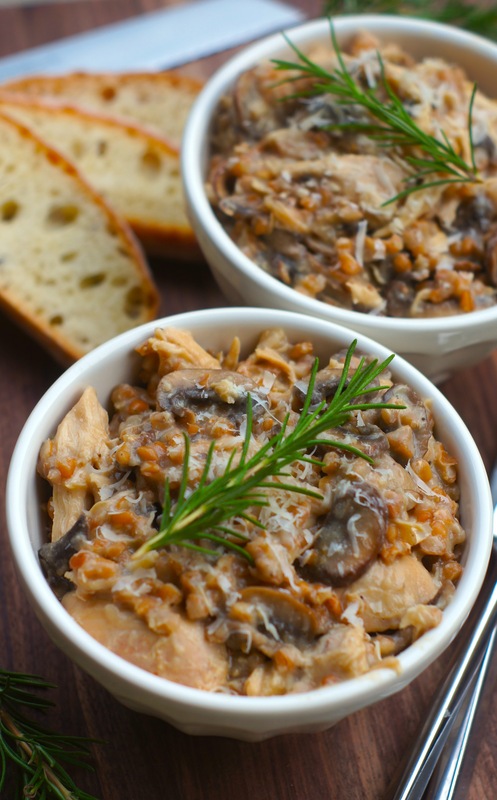 I recently came across this recipe for Slow-Cooker Chicken and Mushroom Farro Risotto and was intrigued. I love risotto and I really love slow-cooker meals, but I had never tried combining the two. The recipe was doubly intriguing, as it uses farro for the risotto, instead of the traditionally-used arborio rice. For those of you unfamiliar with farro (like I was until recently), it’s a hearty, nutty, wonderfully-textured ancient grain. So, this recipe got me to make risotto in the slow-cooker for the first time AND cook with farro for the first time. Gotta love trying new things in the kitchen! 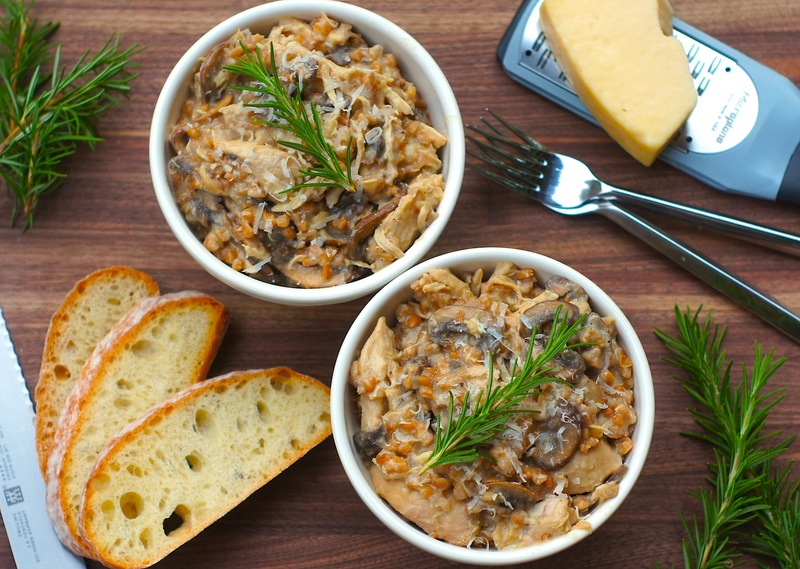 Everything about this is SO delicious: the juicy, fall-apart tender chicken, the wonderfully flavorful mushrooms/onions/garlic, and the cooked-to-perfection farro, all in a truly divine, amazingly creamy parmesan sauce. I first made this on a night when my husband was not home for dinner, as he’s not a huge mushroom fan, so I didn’t think he’d dig it. After I made it + raved about how much Fearless Baby and I loved it, he asked if I’d be willing to make it again for him to try, too. I did a week later, and even though he admittedly didn’t devour every single mushroom, he said it was one of the best slow-cooker meals (and one of the best mushroom meals) he’s ever had. If this can win over a mushroom-hater, it must be truly amazing, right?! You’ve gotta give it a try + report back! *Amy’s tip: Whenever you finish up a wedge of parmesan cheese, save the rind! They are great for flavoring soups, stews, and risottos. Simply pop ’em in a ziplock bag + keep them in the freezer until needed. In a skillet over medium heat, melt 1 tablespoon of butter. Add the onion, garlic, and mushrooms, and saute for about 10 minutes, stirring frequently, until onions are translucent. Transfer to a 4- to 6-quart slow-cooker. To the vegetables in the slow-cooker, add the broth, farro, Parmesan rind, bay leaf, nutmeg, 1 1/4 teaspoons salt, and 1/4 teaspoon pepper, stirring everything together. Top with the chicken. Cover and cook on LOW for 4-5 hours until the chicken is fork-tender and cooked through. Discard the parmesan rind and bay leaf. Remove the chicken from the slow-cooker and, using two forks, shred into large pieces. Return to the slow-cooker. Add the remaining 2 tablespoons butter and grated parmesan to the slow cooker, and stir everything to combine. Cover and cook for 5 minutes more, until butter and parmesan are melted. Serve the risotto hot with additional grated Parmesan, if desired. LOVE this! I just bought a bag of farro. Gotta try this! I haven’t tried cooking with faro, but I think you’ve made me a convert. This recipe sounds amazing! And so perfect for this cooler fall weather we’re having. Beth, it is SO good! It reminds me a bit of barley, which I love, except it’s a bit heartier. You and Rachel will both have to report back how it is if you try it! I have never cooked with farro – this looks great. I have this recipe pinned from Real Simple with plans to try as it gets colder…so glad to hear it gets rave reviews! Crazy drooling over this right now. This may be the first thing I make when the slow cooker comes out this season! I love risotto, love farro, and mushroom risotto is my favorite. This has my name written all over it! This dish sounds divine. I adore farro. I grew up eating it. It is wonderful in salads, as a hot side dish, as a cooked sweet pudding – there is just no end to how you can enjoy it. When you cook it in the manner of a risotto, we call it a “farrotto.” As you have discovered, it has particular affinity for mushrooms. I am so glad you have discovered this truly wonderful food. Enjoy! Farrotto! Thank you for teaching me a new word today. I’m looking forward to exploring cooking it in many ways – it sounds so wonderfully versatile. This sounds wonderful and I am sure its nutty earthy flavors must be so comforting. Amy, this meal looks so delicious and perfect for the fall weather! I love mushrooms in the fall. I love everything about this!! It will be made in my house…but I do have a non-mushroom fan. ( I buy fried porcinis in 5lb bags as I LOVE them…the boy on the other hand? Not so much) Do you have any thoughts about subbing half mushrooms for eggplant or maybe cauliflower? I think they MAY be a good texture and absorb the flavor, but eh, not sure. I am hoping to get him to jump the fence with this one, but I have to start slow….;)! This looks amazing Amy! 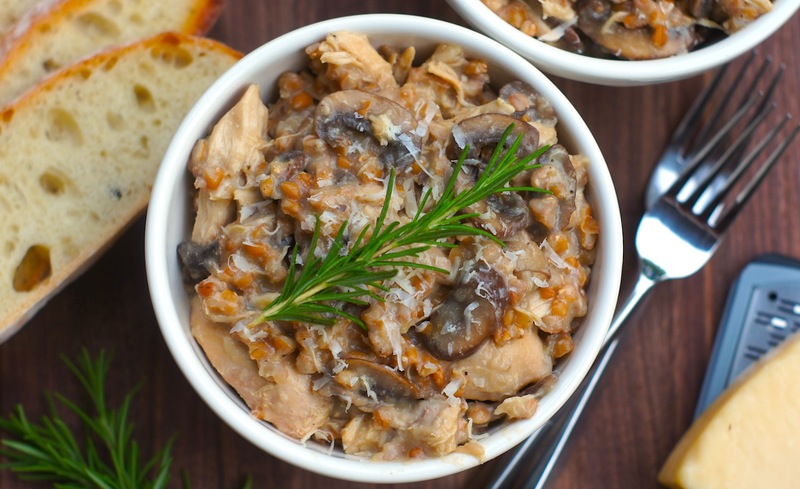 I just pulled out my slow cooker last week and have been wondering if you could make risotto with it so this is just perfect I love that you used farro – such a comforting and tasty dish – so perfect for the cooler months ahead – pinning! This recipe was a hit for dinner last night! It was so easy to prepare and really tasty, too. Thanks so much! I am SO thrilled to hear that, Jessica – Glad y’all enjoyed it! You are so sweet, Meghan – thank you! This looks amazing I’m dying to make it but I have a quick question, would it affect the recipe too much to not use the rind? I just don’t buy parm by the wedge only shredded. Thanks! Hi Ashley, Good question! No, it wouldn’t effect the recipe too much. =) It won’t have quite as rich parmesan flavor, but it should still be really, really great! I would add a bit more cheese to compensate for that – I’d try about 2/3 cup parmesan instead. =) Enjoy, and do report back how you like it! I am in Australia and would love to try this dish – not sure we have Farro here? I have never seen or heard of it! Do you suggest anything else to substitute ? Thanks! Can’t wait to give this a try!! Hi Jessika! I’m not sure exactly what grains you can get most easily in your area, but barley would be a good substitute. Or, sometimes farro is called emmer or spelt in other parts of the world – perhaps it is called one of those in stores in your area? I made this tonight and it was delicious! I couldn’t find farro at my grocery store so I used plain risotto and it still came out great. I’ll have to try it again when I can find the farro. Thanks for the awesome recipe! I couldn’t find Farro but I read another recipe that said you could substitute Arborio rice. I used that and it got so mushy it was inedible. I had to pick the chicken and mushrooms out to salvage the dish. Hi Peggy, Where did you see that I said you could use arborio rice? I haven’t tested this recipe with rice, only with farro + barley, and I typically don’t recommend substitutions that I haven’t personally tried. If you can show me where I wrote that, please do, because I’d like to edit it. Sorry to hear that your substitution didn’t work out well for you. Sorry Amy. I didn’t mean to imply that you said it was possible to substitute arborio rice for the Farro. I googled that question and read it on another site. Just wanted your readers to know that it did not work out. I found your recipe on Pinterest. After a few days thinking of when to make it, today was the day. Cloudy, cool fall-like. Perfect for a hearty dish. My conclusion? This is FABULOUS! I made a few tiny tweaks, adding a few herbs. Delicious! I enjoyed it with a wonderful Langhe Nebbiolo. Absolutely love this recipe. I froze some leftovers and loved it all over again today! Do you think I could make this with boneless pork chops? My husband is allergic to chicken, but I think he’d love this! I’m just worried that the shredded pork might get too dry?